First of all, I need to preface this by saying I got THE best Secret “Politically Correct” Snowman gift of all time this year – a cast iron skillet from Williams-Sonoma! Having our wonderful guidance counselor Seth as my Snowman was definitely the jackpot. He knew I loved cooking and even got me the cookbook Collards and Carbonara to go with it. It’s like he was in my brain…or at least my kitchen. I’ve read the book cover to cover (wait, you don’t read your cookbooks cover to cover?) and have some recipes to try in the future. As for the skillet…At first I felt a little intimidated by it because a) it is ridiculously nice and b) I have a tiny camping cast iron skillet that is a total mess because 6 years ago I had no idea how to clean it and it’s rusty and gross (although… I still use it all the time, mostly for rosemary potato sides). However, I needed to put on my big girl gloves and get cracking. So for my first use I decided to make pork spare ribs. Easy. Delicious. Extra iron now in my diet. Win for all. Preheat the oven to 350. On the stove top, heat up a bit of olive oil in the cast-iron over high heat. Trim excess fat (or not) off the ribs and slice them into individual pieces. Sprinkle on salt and pepper. Brown the ribs on the stove top (all sides). Some fancy websites mentioned a splatter screen. I have no idea what that is. I just made a little bit of a mess and cleaned it up afterwards. Shut off stove top heat. Push ribs to the side of the skillet and toss in some sliced onion. I rearranged the ribs on top of the onion and brushed the ribs with some bbq sauce. You could always make your own sauce but I chose to go the easy route. Place entire skillet in the oven for 1 hour. After 1 hour flip the ribs. Place back in the oven for another hour. If you want them even more brown you can always toss them under the broiler for a minute, but I was happy with the color. You could also have other vegetables or even orange slices in the skillet. Some sites mentioned tin foil. I don’t think I used any. Serve with lots of napkins; these were moist and delicious! did u marinate the ribs? No I didn’t Lucas. Just right into the cooker! Splatter screens are the best! They are only about $10 or so, and look like a screen lid but with mesh instead of metal. You can bring that old rusty one back to life with a potato and some salt! Google cleaning rusty cast iron! 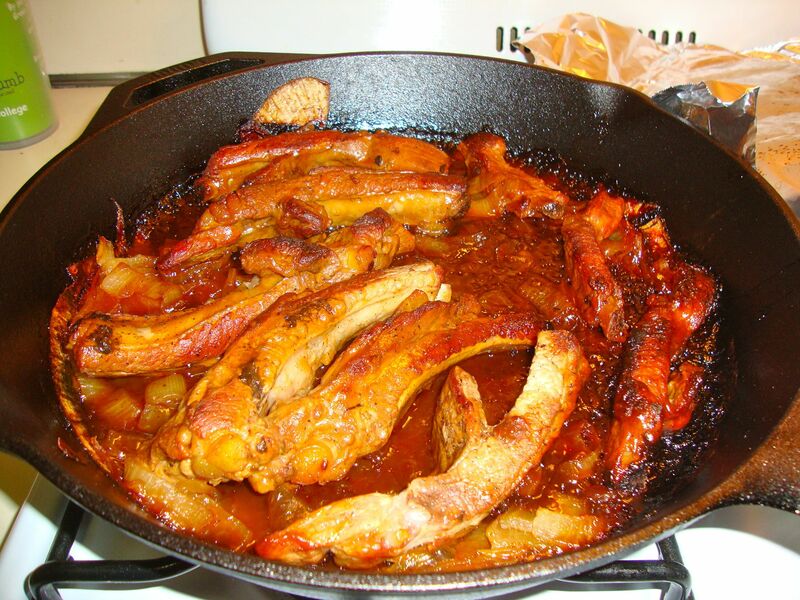 Just tried your recipe with some pretty thick pork ribs. Easy to do, but I found that my ribs cooked at 350 in one hour. I used an electric oven thermometer, and cooked them to 170 degrees…I left the lid off. I did finish them under the broiler for about 10 minutes per side, with additional BBQ sauce…just to get them a bit crusty. Thanks for the recipe ladies !!! !